Who cares about the photo styling, that looks SO good! :) Hope it satisfied your cravings. And how many points was that? Just kidding! It looks delicious. Oh, how I miss cheese grits. I rarely cook them anymore because Alex is allergic to dairy. I was itching to make cornbread with our dinner tonight, but was out. I'm glad somebody had some. Mmmmm.... Where's the pork chop recipe? I love grits, but I am such a Yankee, I put sugar in them. I know it’s like a sin in the South but that is how I have always eaten them. I need to try them with some cheese. Those chops look sooooooo good! 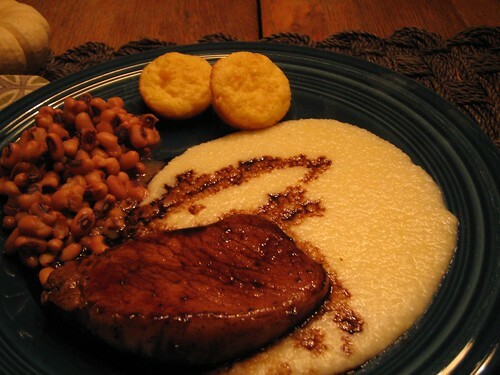 Wow, that is so yummy looking southern cooking. I don't know that I've ever actually had southern cooking. Gorgeous Plating! you should be a food stylist. maybe Southern Living is hiring. are they based down there?